The cosmetic dentistry techniques of top Encino dentist Dr. Matian put your personality and your smile first so you can live your life with confidence. 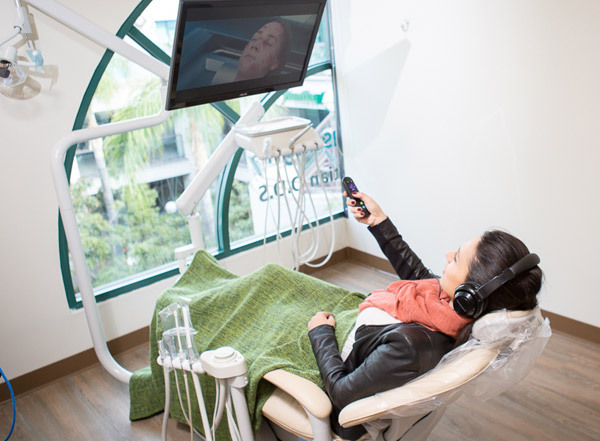 Top Encino dentist Dr. Matian has created a facility streamlined with cutting-edge technology to provide the highest quality cosmetic dentistry procedures. Patients new to Dr. Matian’s dental practice in Encino will receive a full dental exam, digital x-rays and a complete dental cleaning for only $49 (regularly $250). BioDental’s state-of-the-art facilities are conveniently located in the Encino Town Center and reflect the cutting edge of dental technology provided by top Encino dentist Dr. Matian. Enjoy a natural, soothing setting with modern entertainment amenities. A bright smile can make all the difference in your confidence and success. At BioDental, we provide some of the best dentistry services and restorations in Encino, all with the latest in digital and manufacturing procedures. 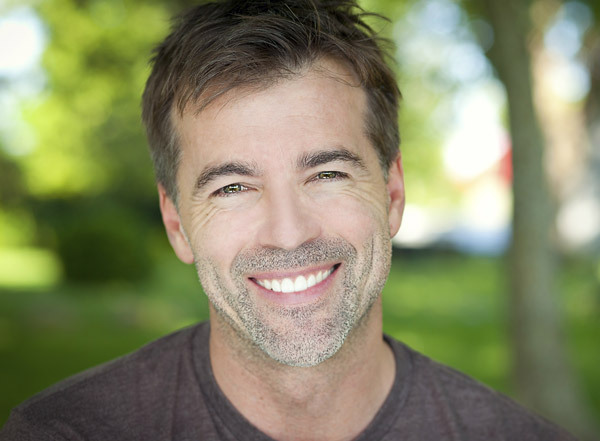 Encino cosmetic dentist Dr. Matian can help make you look younger. Dental health is one of the pillars of a healthy mind and body. Dr. Matian and the staff of his Encino office provide a modern, relaxing environment to ensure that your routine dental experiences are positive and comfortable. When you step into the fully accredited dental suite of BioDental in Encino, California, you will have entered a space designed for your total comfort through today’s leading general and cosmetic dentistry techniques. 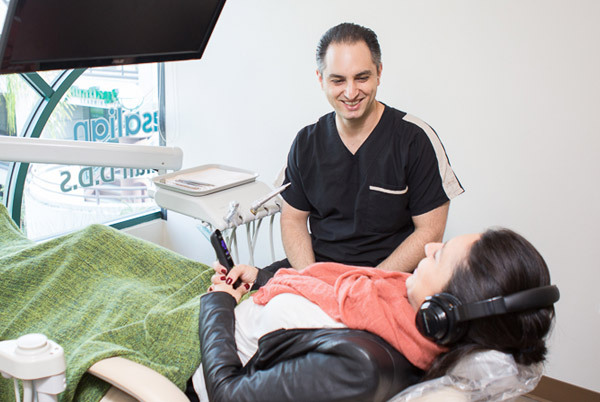 From the natural décor and in-room audio visual entertainment to digital dental equipment and streamlined lab services, it’s clear that the top priority of BioDental staff under the leadership of Encino dentist Dr. Shawn Matian is ensuring your experience is a positive one. In today’s fast-paced world, it is essential that dental procedures are not only safe and effective, but also that they interfere as little as possible with your normal routine. Dr. Matian and the BioDental team can make this possible through the breakthroughs of the chairside solutions of CEREC (Ceramic REConstruction) technology. Using a combination of computer-aided design and manufacturing components, many of the processes previously outsourced to the lab can now be done in-house in a single appointment—dramatically reducing the time required to complete your dental procedure. The CEREC technology not only allows for a faster procedure but also an extremely accurate one. Using an optical camera, top Encino dentist Dr. Matian captures the exact dimensions of your teeth in three dimensions. After sizing and design, Dr. Matian uses the CEREC milling unit to create the restoration directly in the BioDental office. Once the doctor matches the color of the restoration to your teeth for the ultimate natural look, he cements and polishes the restoration and checks your bite for final quality and comfort. Using CEREC technology also means that when cases allow, more of your healthy tooth will remain intact to further enhance your oral health. To find out more about the dental restoration procedure, schedule your free Cosmetic Dentistry Consultation today. Dr. Shawn Matian is a fully accredited top Encino dentist with a passion for cosmetic dentistry and emerging dental technologies, including metal-free dentistry and computer-aided design and manufacturing tools. A native of the San Fernando Valley, Dr. Matian’s dental inclinations are a family affair, with both his father and his uncle also practicing dentistry. Dr. Matian’s unique background lends itself to adopting cutting edge technology and leading cosmetic dentistry practices. He earned a Bachelor of Science in Computer Science in 2000 before deciding to pursue dentistry at the Ostrow School of Dentistry at USC. During his professional education, Dr. Matian was drawn to the latest developments within the field, including advances in biomimetic dentistry, which focuses on restoring teeth using biochemical friendly procedures and ensuring teeth look as natural as possible. 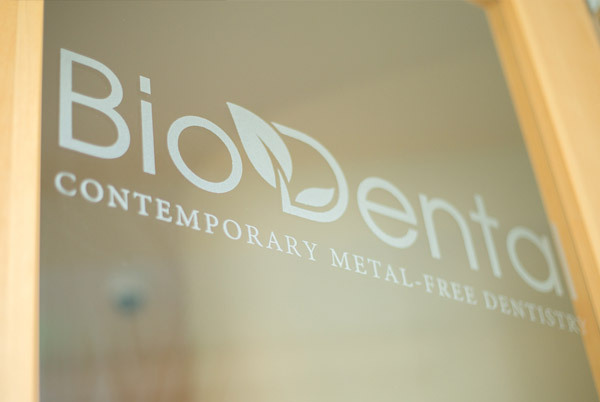 Dr. Matian created BioDental in 2009 where he continued to emphasize biocompatibility and natural dental aesthetics in his pursuit of high quality, metal-free general and cosmetic dentistry in Encino. The doctor currently lives in Tarzana, California with his wife and two children, where he continues to pursue his interests of technology and science, personal fitness and travel. Dr. Matian provides a one stop dental practice allowing patients to receive everything from restoration to porcelain veneers at his Encino location. For patients with limited time, many restorations including crowns, inlays and onlays can be accomplished chair-side using the latest CEREC technology. There are many new innovations to cosmetic dentistry which make it possible to correct long standing unsightly problems in a much shorter time frame than most people are aware of. In fact, some procedures can now be done in one visit using the latest innovation in restoration technology called CERE. Dr. Matian provides a wide range of state-of-the-art cosmetic dentistry services ranging from a simple one hour teeth whitening procedure, to full dental implants. Adolescents and adults looking for a discrete solution for misaligned teeth need look no further; Encino dentist Shawn Matian has many options that allow a rapid correction without a long term commitment to metal braces. 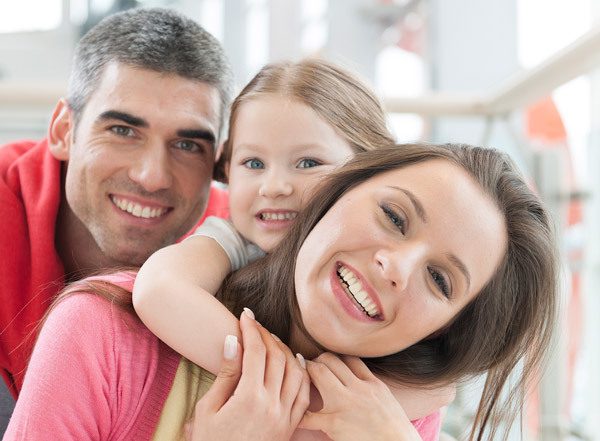 Patients are offered an extensive range of services for children and adults from preventive cleanings and dental hygiene education through the whole spectrum of dental restoration including cosmetic enhancement. As a leading holistic dentist, Encino residents can rest assured that they will be receiving only biocompatible materials specifically tailored to their needs based on scientific testing done in the office. Metal fillings, implants and crowns are avoided as Dr. Matian feels that exposure to metal poses an unnecessary health risk to his patients. As part of his commitment to dental health, his patients are offered consultations on the best vitamins and minerals to use to prevent gum disease and tooth decay. Find out why Dr. Matian’s patients call him the best dentist in Encino. When you step into the BioDental office in Encino, California, you will see why patients choose Dr. Matian and his team for their dental needs. Treat yourself to an experience that is not only technologically advanced but is also provided by a staff that truly cares about your comfort and relaxation. At BioDental in Encino dentist Dr. Matian has combined the perfect blend of biocompatible techniques with digital imaging and manufacturing to create aesthetic smiles that are a true reflection of your personality. 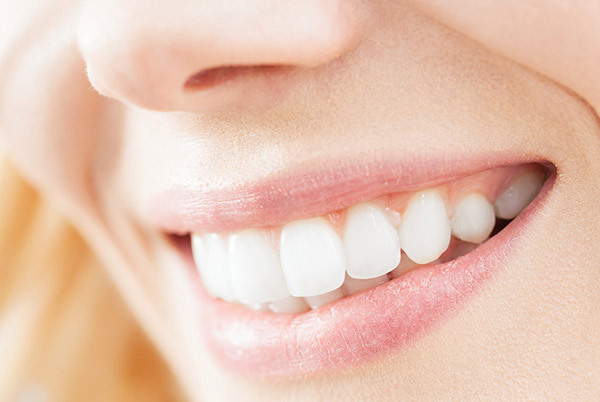 If you're looking for a dentist in Encino, schedule your free consultation today and see how Dr. Matian and his team offer a positive experience and the confidence in your smile that you’re looking for.